Poetry can be fun and this is the very first poem I learned in my own youth in elementary days over 45 years ago! 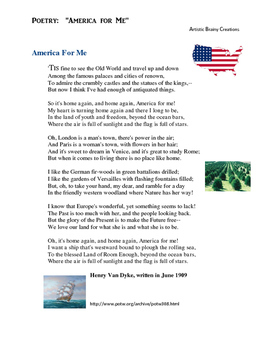 It still endures and my students have enjoyed this poem, "America For Me." The rhymes are easy and the main idea is very explicit and a great poem for them to start with. 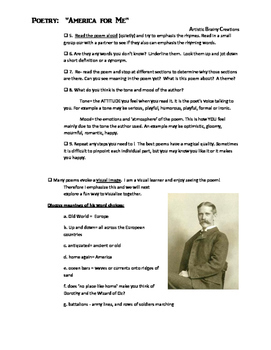 The 19 page lesson includes the procedure, the poem, an outline of definitions, How to Read a Poem, and visual clues to help students see this poem. Also include are charades and props to help the students make this poem come to life! They will be able to memorize this poem by the time you are done. 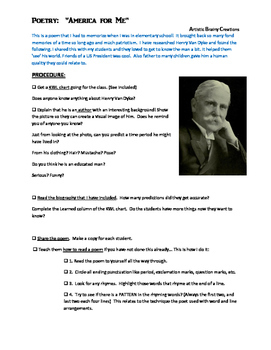 A biography of the author, a test/quiz, KWL chart and answer key are also provided. The use of rhymes, patterns in the poem, stanzas, and repeated lines for emphasis are taught. The author used many colorful adjectives, metaphors and even a simile to help make the poem poetic. 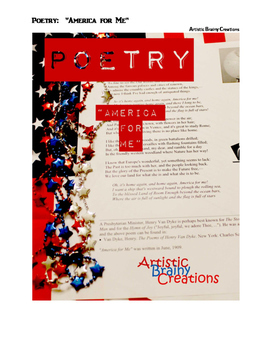 The common core standards are listed and several ways to teach the poem with small group work are provided. What a FUN and engaging way to stimulate the brains of visual learners and the kinesthetic learner too with much movement.